One of our very first customers emailed me this picture slide show/story. Check out Bi Bi's dramatic rescue. It is intense and has a happy ending! It is absolutely amazing, thanks guys! New 'dog only' beer hits shelves What will they think of next? How to train a dog to get a beer from the fridge too funny! Last but not least, Awesome beer fetching dog. Hope everyone had a good Holiday, we did! Welcome back to Monday! You might remember reading about Daphne on her assessment day. She has been slow to warm up to the idea of playing, though she has been a great greeter and calm companion. Today, though, she did a complete 180 from her usual self and was busting out the moves! She played hard all morning, with any dog who was willing. Check out a couple clips! It's always really exciting when a dog starts to play and have more fun here at the Fort. Sometimes it takes a few minutes, and sometimes it can take days, weeks, or months before a dog is in the right "place" to bust out. The right mix of other dogs, and an increased confidence level help a dog to come out of its shell. While the first part can be random, you can help your dog to be more confident by keeping a regular routine and by following the other separation anxiety tips that Grant wrote out for us. P.S.- If you decide to get Santa pictures with your dog, be sure that you bring in a copy so that we can scan it and put it up here on the blog! to keep your companion animals safe and secure. objects fall or fly in the wind or the noise of a big gust frightens them. · Bring your pet inside during the storm and watch them when let outside. · Check all fencing and lock all gates. · Dogs and cats can get frost bitten ears, nose, and feet if left outside. to hold in its body heat. -Make sure the water bowl does not freeze. Heated water bowls are available. -Outdoor pets need more calories to produce body heat. near the engine. Tap on hood before starting the engine. -Make sure horses and other livestock have clean, dry bedding. -Make sure water in trough does not freeze. · Be sure you know important emergency numbers. Just a reminder, we will be closed tomorrow, Thursday November 25th and Friday November 26th. We will be open for business this Saturday, November 27th. Today is the conclusion of my little ditty on S.A. you can view Part 1 here and Part 2 here. Create a schedule for your dog and stick to it! This will really pay off if you can do it (it will also help solve many other common issues like potty training). Although dog's are resilient, they thrive on routine. To me, the more rigid, the better. For Example: Fido get's woken up out of his crate at 7:00am, he sits at the door and goes outside to potty, once his owner gives the command. He get's called back in for breakfast and sits before being allowed access to his morning grub. After breakfast, he goes for a half hour walk around the neighborhood at 8:00am. From 8:30am to 9:30am he may hang out in the living room with his favorite chew toy. At 9:30am he goes to Daycare at The Fort (sitting before he comes in the door of course) and get's picked up at 5:00pm. He get's fed his dinner at 5:30pm, sitting before being given the OK to chow down. From 6:00pm to 9:30pm Fido hangs out with the family. At 9:30pm he get's one last potty break and or romp in the yard before bedtime at 10:00pm. Please note, this is just a rough example however I'm pretty sure you get my drift. It's a sample routine that makes dealing with Fido easier... It takes out the guess work. If you would like to go a bit more in depth with working out a schedule for your dog, talk to one of the Fort Fido staff members in person. Pertaining to daycare, we have customers who bring their dog as little as one half day every other week but you know what? It's the same day, same time and the dog knows that he/she is going to The Fort and can't wait to play. This type of daycare schedule AKA consistency, assists the dog in finding it's groove with the pack. The opposite style, popping in randomly can have quite a different effect on a dog. Especially one prone to S.A. or combined with other bad owner habits. The dog never knows whether it's coming or going and can't relax because it's constantly worried about it's owner. No rewards for bad behavior! Let's make this one quite a bit more condensed and to the point. Here I sound like a broken record but BE CONSCIOUS OF YOUR ACTIONS WITH YOUR DOG AT ALL TIMES. It is all about choice, do not allow yourself to "act a fool" or subconsciously reward a behavior that you swear you don't want your dog to do hahaha... I get that one all the time. Many times we do not realize we are doing anything wrong. That's fine for a moment but stop yourself, think and realize. Dog's take things literally! Everyone is smart enough to figure this stuff out. I've seen small children do better with their dog than their parents do! Example: Fido jumps up on the counter, near the treat bowl, at doggie daycare. You scold him then give him a treat because he obviously wanted one. Fido now thinks that if he jumps up on the counter he will get a treat after a scolding that basically means nothing, doh! Example: Fido doesn't jump on the counter but you want to give him a treat. You make him sit and stay calmly, then hand him a treat. Nice job, Fido now thinks that if he sits and wait's patiently he will get a treat. You've rewarded behavior that you want, good job owner! It is so very simple! That about wraps it up for now. Please, if you have any questions do not hesitate to ask a Fort Fido staff member. We can get very busy but try our best to answer any questions that you have, do not be embarrassed to ask! When working with your pet, be confident, don't allows others to make fun of you or question your methods. If you have other people in your household make sure to get them on the same page. Don't let them undo your efforts. The proof of success will be in your dog's ability to stay under your command in any and all situations regardless of others actions or behavior. This is the goal, total control at all times and a happy healthy pet! Also, remember to see the baby steps or little improvements along the way and have fun! Don't stress yourself out, just promise to do better and better each day for you and your dog! We can still get our human emotional needs met, we just need to better understand the differences of the K9 brain. Make your interactions with your dog on your terms, not theirs! P.S. Our friend Hope summed S.A. up nicely, "An independent dog is a happy dog. I suppose it feels nice to "feel needed" but not when being needed eats your couch!". Hahaha, awesome! 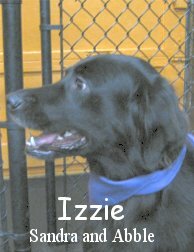 Meet Izzie! 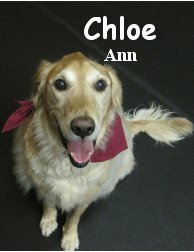 She is a four year old, 72 pound, Retriever Mix. She had her assessment on the morning of the 19th in the Big Roll... I've been too busy writing about S.A. and forgot to mention her! She did ok for her first day at The Fort. Her sis Zoey comes and really tears it up (plays well with the other dogs lol). We hope that Izzie will start doing the same. In between the separation anxiety story, here are some clips of what went down on Saturday! Gabriel was tearing it up, playing with anybody in sight. It seemed impossible to get a clip without him in it! He played with big dogs, and small dogs, slower dogs and faster dogs. PS-- Here's a little Santa-Watch update! Get pictures of your pet with Santa Paws Saturday December 4th between 9am and 1pm at Windmill Village here in U.P. You can also get pictures with Santa at the Petco on Tacoma Mall Boulevard on December 4th and 11th. On yesterday's blog post, I explained a bit about Separation Anxiety in dogs, particularly daycare dogs. Today I wanted to begin discussing the subject more by offering you some tips that will help you and your pet overcome this disorder. In my opinion, these tips are so easy and the key to successfully ridding your dog (heck, maybe even your kid lol) of S.A. However they can be most difficult for us humans to do. :) Let's hop to it! Be EXTREMELY conscious of your "Comings & Goings"
When you leave your dog ANYWHERE (home, work, it's crate/kennel, the car for a minute, DOGGIE DAYCARE or the groomer) DO NOT, I repeat, DO NOT butter them up with affection. No kisses, cuddles or long good byes... Spin on your heels and leave, don't make eye contact with them or say anything! In doing this, you will portray to the K9 mind that your "Comings & Goings" mean nothing. You leaving shall not affect their mood or behavior. When we do the opposite of this (by baby talking them, hugging them, whimpering and telling them everything is going to be OK, generally making a scene...) our dogs are literally thinking, "Holy cow, they are not OK right now, I need to worry about them!". Most of us tend to think that a dog's anxiety is them missing us and not wanting to be alone, it couldn't be further from the truth. They are worried about us because we act so wacky every time we leave them! They think we are having major issues that they need to try and resolve. Coming home or picking your dog up from ANYWHERE should be no different. DO NOT greet them or acknowledge them right away! It is all about timing, anywhere from a few seconds to 15 minutes. Wait until your dog is displaying some behavior that you want (like sitting calmly) then go in for the hug and cuddles. Doing the opposite of this, you are basically rewarding your dog for acting like a maniac (jumping, howling, fidgeting, etc...) when you pick them up. Make them do something for you! All the time! This is quite simple, for example: Before you let your dog outside or through any type of doorway, make them sit and wait until you say it's OK. Before you give your dog a meal, make them sit and wait until you say it's OK. There are many positive things you can make your dog do for you. Those two things are a great start that will get you on the right track. Doing so will help your dog be more patient and attentive to you and your commands. They want to please! If you have a young puppy or are planning on getting one please socialize them early (before six months is key). Get them into doggie daycare, take them to the dog park and on walks frequently. Have them meet many different people (young, old, tall, short, etc...) with a goal of having them sit and stay calmly while being pet. Dogs are pack animals and the K9 brain is very different from our own. Dogs thrive off of strong leadership. If they aren't getting it they will try their best to be the leader. Unfortunately this will lead to circumstances that we will not enjoy. Some may think this is all a bit harsh but the opposite is what is harsh, fulfilling our needy little needs and not our dogs'. I'm not saying we can't love our pets, we need to love them more and strive to be in tune with them. Be on the lookout for the conclusion, Separation Anxiety Part 3. It will give more insight and include even more helpful tips. Today I wanted to touch on a topic that we deal with here at Fort Fido on a daily basis. The dreaded, Separation Anxiety in dogs! Separation anxiety is a developmental stage during which the dog experiences anxiety when separated from the primary caregiver. During daycare, many dogs with this ailment are relieved with help from the pack. The other pack members tend to having a calming/mood stabilizing effect over the sufferer, but not always! The behavior associated with Separation Anxiety manifests in different ways. In Doggie Daycare, the main manifestation is an inability to relax or socialize "normally" with the pack. Instead of playing and interacting with the other pack members a dog may whine, bark, pace, howl and shake. It may even appear to be a bit of an "outcast" standing alone in the corner. Very well balanced members of the pack will pull out all the stops to get the individual out of it's shell. Now, obviously, everyone wants their pet to get along well with the others at daycare by socializing and playing hard! That is the point, that way they come home tired and may be a bit easier to deal with. Many times, people do not correlate their actions during "dog interaction" with their dogs negative behavior. We often hear things like, "It's not me, it's the dog! ", especially when conversing about Separation Anxiety. Unfortunately, here is the truth... It is rarely, if ever, pretty much NEVER, the dogs fault! It is us, the owners! We tend to humanize (yes, I'm guilty too) our animals by projecting our human thoughts and emotions on to our pets. Unfortunately, depending on the situation, this can have lasting negative effects on our K9 companions behavior without us even realizing it. To put it frankly, we liken it to mental abuse. As extreme as that sounds, it is what it is. The good news is that we can change how we interact with our dog. On tomorrow's blog post I will be discussing some helpful tips on overcoming Separation Anxiety. Whether or not your dog has it, these tips will truly benefit the relationship you have with them. They will help you gain a better understanding of the doggie mind and help you get the most out of Doggie Daycare here at Fort Fido. *Edit* Separation Anxiety Part 2, Part 3, other S.A. related articles! Mark your calendars... We have a new Basic Obedience and Leadership class starting up, after the Holidays, on January 18th 2011. If you are interested, checkout the Training Page of our site for more information. Here are a couple of doggie links I found today: Now Your iPhone Could Save Your Dog's Life and What Are The 5 Best Dogs For Your Family? Bella and Romeo had an awesome time today in the Medium Roll, check it out! Here's a clip from the action today! You can see Gem (a Bernese Mountain Dog), Lila (a husky-mix), Blue (Lila's "sister,"and a lab mix), and Otto (a six-month-old Giant Schnauzer puppy). Today was Otto's first day back after getting neutered about a week ago, and boy has he grown! He's right at that puppy stage where they seem to get a little bit bigger every day, and it was surprising to see how much he'd grown in just one week. 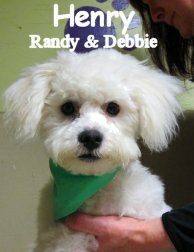 PS-- Check out this amazing rescue story! This morning we assessed Hanz. 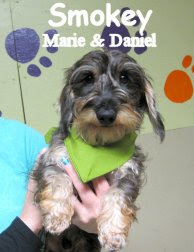 He is a four year old, fourteen pound, salt and pepper colored, Miniature Schnauzer. Hanz didn't do half bad for his first day upstairs in the Little Roll. He played a little bit while scouting the area and meeting all the dogs. 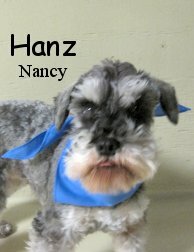 We hope to see Hanz "bust out" and interact even more... We have a feeling he will and he'll get his chance because he is coming back to Fort Fido soon! 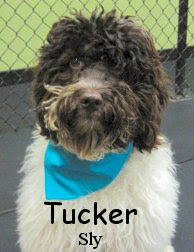 Meet Tucker, he is a nine month old, twenty-four pound, chocolate and white, Australian Labradoodle. He had his assessment this morning and boy is he a sharp looking pup. Tucker did a great job today in the Medium Roll and was quite a pleasure to have at The Fort. We are delighted to be seeing him again shortly. Awesome job Tucker! Happy Veterans Day! Thank you to all who have served. A Heck of a Henry! Henry had his assessment today. He is a dashing little six month old, eleven pound, Bolognese. Henry is already proving to be an outstanding daycare dog! He wasted no time upstairs in the Little Roll going straight into play. We are very pleased with Henry's social skills and can't wait for him to attend Fort Fido more often. Nice job! P.S. Two good snippets I found: You may remember this pooch, Dog that 'came back to life' gets new home & British Special Forces Deploy 'Dogs of War'. 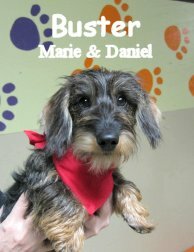 Buster and Smokey are two litter mates that assessed this morning. 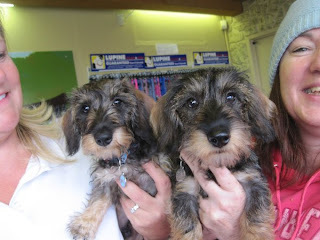 Checkout these two cuties... Buster and Smokey are five month old, seven pound, Male, Wire haired Miniature Dachshunds. Buster was a bit more adventurous then his brother Smokey. Both dogs explored their environment and did fine for their first day at The Fort. They will become two great additions to the Little Roll upstairs. Today I noticed a couple of the girls renewing their friendship! Gem is a Bernese Mountain Dog and Gemma is a a Golden Doodle. When Gem was a bit littler, she used to be in the medium roll with Gemma, and it seems like they still remember each other well! The two of them were buddies all day long, playing and hanging out together. Here's a clip of them tearing it up. P.S. Don't forget Daylight Savings Time ends tonight. At least this time of year we gain and hour of sleep, instead of lose one! 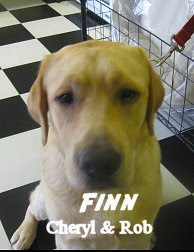 Our pal Finn is a Fort Fido good ol' boy lol. He has been coming to The Fort for quite some time. If you search for "Finn" on our blog you will find many clips of him tearing it up! We really enjoy Finn, he is a very well balanced member of our Big Roll pack. He ain't bad looking either ;). Unfortunately, Finny suffers from Canine Epilepsy... The good news is that his owners have started a wonderful non-profit organization called Finn's Fight! Their goal is to raise awareness of Canine Epilepsy and to raise money for families that can't afford the medication (it is very expensive so many pets suffer or get put down). They plan on having some local doggie dashes as well as other events to get the ball rolling. Finn already has 600 friends on facebook, wowza! Way to go Finn, Cheryl and Rob. Keep up the good fight! Checkout this happy go lucky pooch! We had him in for his assessment this morning. 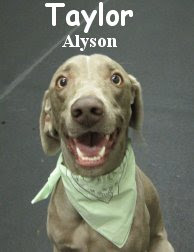 Taylor is a two year old, 60 pound, Weimaraner, rescue dog. He did well for his first day in the Big Roll. His owner wants to better his doggie social skills and etiquette, we think he is on the right track. Way to go! Taylor we'll be attending The Fort again soon. One of our favorite little poodles, Gracie Anne, sent us in her wonderful Halloween photos. As you can see, she was the perfect Snow White! Too bad she didn't have the seven dwarfs accompanying her. If her owner would like, we could put her in touch with a good breeder ;) hahaha. P.S. Found two interesting dog articles today: Author of 'You Had Me at Woof,' talks about dogs and Cesar Millan, The Dog Whisperer, Blocked From Entering Canada. On Monday, we assessed a sweet Golden Retriever named Chloe. Chloe is a rescue dog that is seven years old and about 66 pounds. She did pretty decent in the Big Roll. This morning Hank came in for his assessment. 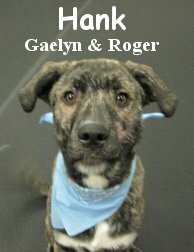 He is a eight month old, 56 pound, Dutch Shepherd (Haven't had this breed in here before, quite striking!) Mix. Hank is good boy, he played in the Big Roll and seemed to enjoy himself. We hope these new friends of The Fort will return for another visit soon. Now get out there and vote ;) ! My Owner is an Idiot! I hope everyone and their pets had a fun/safe Halloween! One of our customers emaiedl me a set of very funny pet pictures titled "My Owner is an Idiot!". I picked out a few of my favorites to share with you, they are too good! P.S. Mark your calendars, Fort Fido will be closed November 25th and 26th for Thanksgiving.